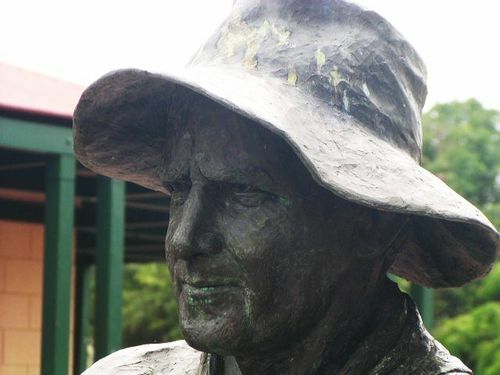 Statue bequeathed by the estates of Charlie and May Crossland to honour the pioneers of the sugar industry in the Mulgrave Area. The area of Gordonvale was first settled in 1877 by white families on the tribal lands of the Yidinyji-Malanbarra. It was previously called Mulgrave and then Nelson and finally Gordonvale after the local pioneer John Gordon. The Mulgrave Central sugar mill near the centre of town started as far back as 1896 and operates six months of the year. Sugar production is declining and in recent years large stretches of sugar fields have been converted to new suburbs.